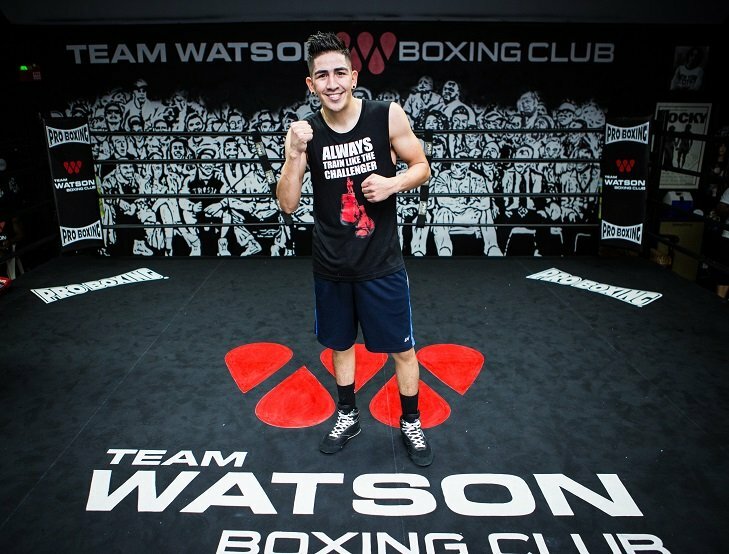 Three-division world champion Leo Santa Cruz hosted a media workout Tuesday at the new Team Watson Boxing Club in Lake Balboa, Calif. as he prepares to defend his featherweight titles against Chris Avalos on Saturday, October 14 in the main event of Premier Boxing Champions on FOX and FOX Deportes from StubHub Center in Carson, Calif. Televised coverage begins 7:30 p.m. ET/4:30 p.m. PT with four-time world champion Abner Mares defending his 126-pound belt against once-beaten Andres Gutierrez. Tickets for the live event, which is promoted by Ringstar Promotions and TGB Promotions, are priced at $30, $50, $75, $100, $150, and $250 and are on sale now. To purchase tickets, visit AXS.com HERE. Also in attendance was lightweight Ivan Redkach, who trains with Santa Cruz and will compete in an undercard bout on October 14. “Now we both get another fight first, I’m pretty sure we will both win and the fans win by seeing us again as well. “I always train the same way. I train really hard. I go out there like I’m going to fight the best opponent possible. My focus is there. You can never underestimate any fighter. Especially someone like Avalos. He has nothing to lose and everything to gain by beating me. “Fighters like that are the most dangerous. They come really prepared and I can’t afford to lose. I am going to be focused coming into October 14. “If we both get the win, I want the rematch with Abner in the beginning of the year. That is going to happen so I’m not concerned about both of us taking a fight first. “I feel great and will be ready and prepared to fight 12 hard rounds on October 14. “I know this will be a tough fight, every fight at this level is a tough fight. “I am coming off of two hard fights and I wanted my body to rest, but I am always ready to get in the gym and prepare to do my best. I will never take a fight lightly and I won’t on October 14. “I’m very excited to fight in Southern California on a big show against a tough fighter. I’m ready for October 14th. “This is my third fight training with the Santa Cruz family and I love training with them. They’ve taught me a great deal about defense and about throwing combinations. I feel like it’s more of a ‘Mexican Style’ for me. I feel like they have helped me become a more entertaining fighter. “I know Mares and Leo will put on a great fight and both need to be prepared for the rematch. “We’re working on tighter defense and better ring generalship in this camp. “Leo just went 24 action-packed rounds with the 2016 Fighter of the Year [Carl Frampton]. He has been in nothing but slugfest fights with 3 out of his last 4 fights ending in a majority decision, and don’t count out Chris Avalos one bit because he can crack. That is the last thing you want. Avalos is motivated and he needs a win. “”When Steve Farhood [of SHOWTIME Sports] did his 2016 10 best one-punch knockouts in the history of ShoBox, Chris Avalos was on there because he has that one-punch knockout power. “Avalos has one punch knockout power and that’s the kind of guy you have to be very careful with.